In 4-quart saucepan, place potato pieces and add enough water to cover. Heat to boiling; reduce heat to medium-low. Cook uncovered 15 to 20 minutes or until tender. Drain and return to saucepan. Heat oven to 350°F. Spray 8-inch square (2-quart) glass baking dish with cooking spray. Add milk, salt and pepper to potatoes. Mash with potato masher until no lumps remain. Beat in sour cream, chives and 1/2 cup of the cheese. Spoon into baking dish. Sprinkle with remaining 1 cup cheese. Bake uncovered 10 to 15 minutes or until thoroughly heated and cheese is melted. Instead of the Cheddar cheese, you could use Colby or Colby-Monterey Jack cheese blend instead. 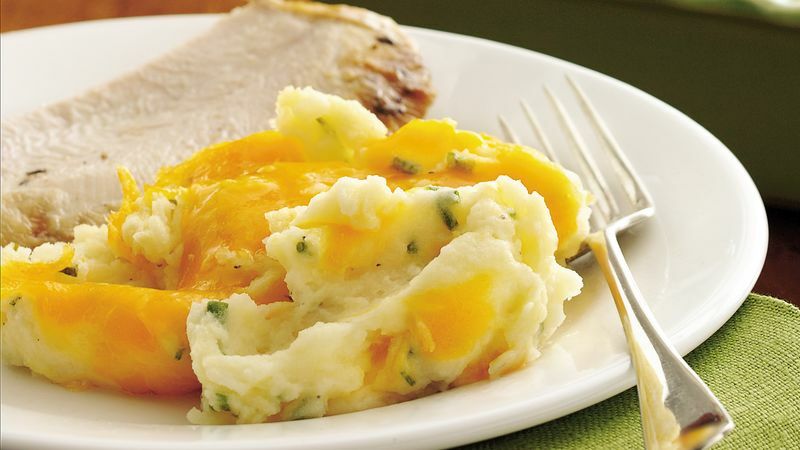 It's best not to use an electric mixer to mash the potatoes; they can quickly become gummy instead of smooth and creamy. Do-Ahead Directions: After beating sour cream, chives and 1/2 cup of the cheese into mashed potatoes, spoon into baking dish. Cover with foil; refrigerate up to 24 hours. Bake covered 30 minutes. Sprinkle with remaining 1 cup cheese. Bake uncovered 10 to 15 minutes longer or until thoroughly heated.